The overarching goal of benchmarking both patient quality factors and labor productivity is to make the most out of each patient dollar to provide the best care possible. The process is neither simple nor quick, but its ongoing impact can be substantial. 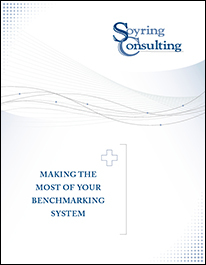 Contrary to practices undertaken at some hospitals, benchmarking should not be limited to comparisons with national averages. Rather, facilities have the opportunity to review peer hospitals to determine what they are doing effectively, and how you can do equal or better. Soyring Consulting provides managerial and operational consulting services to healthcare facilities of all sizes, including For-profit, Not-for-profit, Community, University, and Faith-based facilities and systems. Two of our key areas of focus are Chart Audits & Clinical Records Review and Appeals & Denials Consulting.